until Monday 11 March. Take advantage of the group rates at the Hilton at the Ballpark, also extended until Monday, March 11. 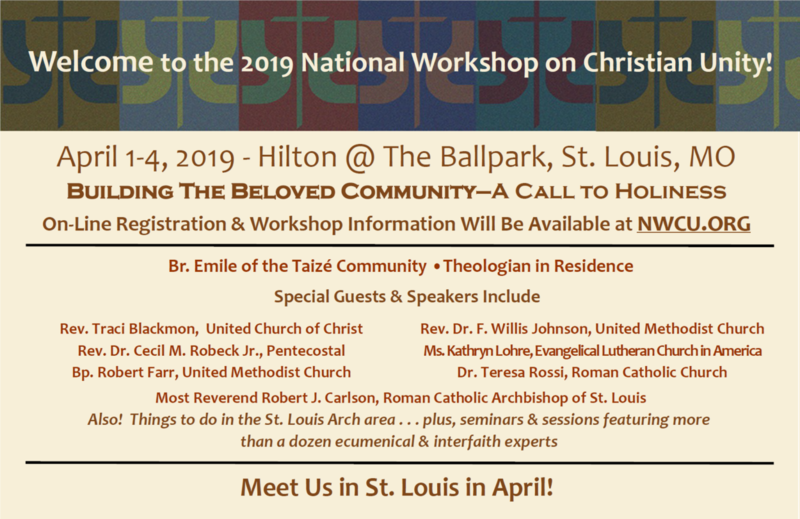 The upcoming workshop includes a rich program of plenaries and seminars, a banquet, off-site tours, and opportunities to join together in prayer. The theologian in residence will be Brother Emile from the Taizé Community in France. He will lead us in daily prayer, reflections and study throughout our time together. Please check back with us as we finalize our Plenary and Seminar Speakers. The National Workshop on Christian Unity has advanced unity and reconciliation among various Christian communities for more than 50 years. The Workshop continues to be the only gathering of its kind at a national level in the world. The annual event brings together ecumenical representatives, ecumenists, and interested members from all churches who share one faith, one baptism in Jesus Christ. Please review the CADEIO Schedule for the week prior to making travel arrangements. This entry was posted in News and Updates on March 8, 2019 by CADEIO CADEIO.